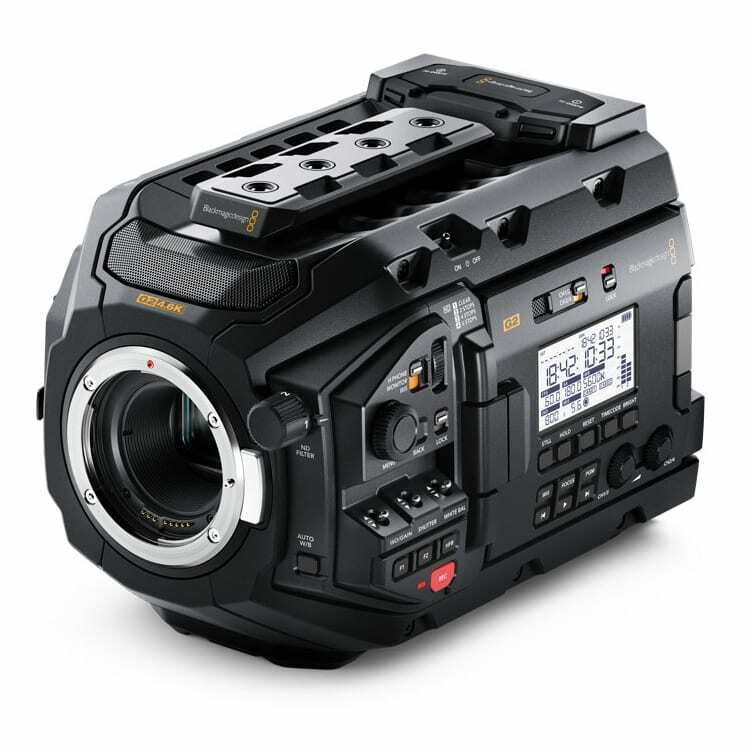 Blackmagic URSA Mini Pro 4.6K G2 is a next generation digital film camera with updated electronics and a high performance 4.6K HDR image sensor for shooting at up to 300 frames per second. You get a Super 35mm 4.6K sensor with 15 stops of dynamic range, built in optical ND filters, interchangeable EF lens mount that can be swapped for optional PL, B4 or F mounts. 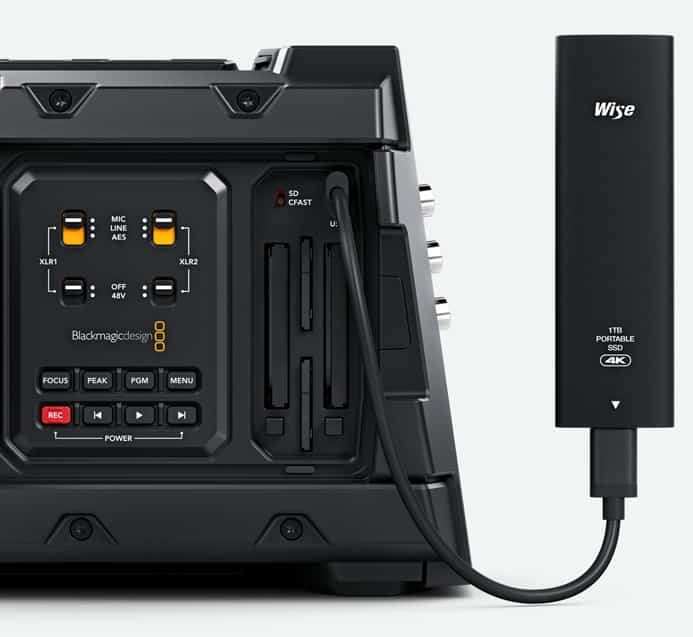 Blackmagic RAW and ProRes recording to dual CFast or dual SD cards, and an innovative USB-C expansion port for recording directly to external disks. In addition, URSA Mini Pro 4.6K G2 features a massive set of external broadcast style controls, backlit status display, foldout touchscreen monitor and more! 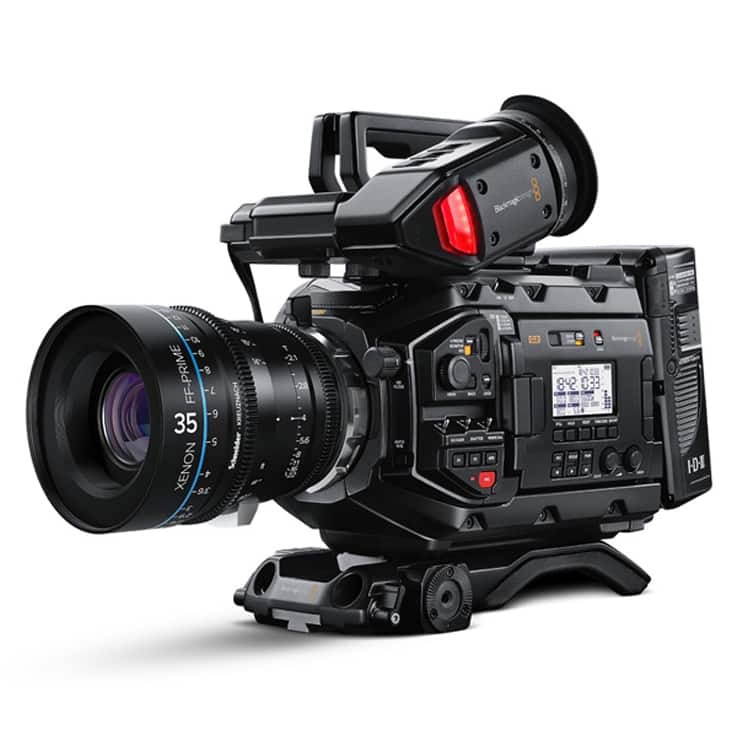 Blackmagic URSA Mini Pro 4.6K G2 features neutral density (ND) filters with IR compensation for quickly reducing the amount of light that enters the camera. The 2, 4 and 6 stop filters are specifically designed to match the colorimetry of the camera and provide additional latitude, even under harsh lighting conditions. That means customers can use different combinations of aperture and shutter angle to achieve shallower depth of field, or specific levels of motion blur, in a wider range of situations. Blackmagic URSA Mini Pro 4.6K G2 also includes a new and innovative high speed USB-C expansion port for adding accessories such as an SSD for external recording. That means customers can now record for even longer durations without stopping. Plus, they can record directly onto the same external disks they will use for editing and color correction. Lens Mount EF mount included. Interchangeable with optional PL, B4 and F lens mounts. Built in ND Filters Four position ND filter wheel with clear, 2-stop, 4-stop and 6-stop ND filters. Focus Focus button turns on peaking, auto focus available using compatible lenses. Iris Control Iris wheel and touchscreen slider for manual iris adjustment on electronically controllable lenses, iris button for instant auto iris settings on compatible lenses so no pixel is clipped in film mode. Scene average auto exposure in video mode. Screen Type LCD capacitive touchscreen. Metadata Support Automatically populated lens data from electronic EF, B4 and i/Technology compatible PL lenses. Automatic recording of camera settings and slate data such as project, scene number, take and special notes. Controls Touchscreen menus on 4 inch screen. Push buttons for other controls. 2 assignable shortcut keys. Timecode Clock Highly accurate timecode clock. Less than 1 frame drift every 8 hours. Total Video Outputs 1 x SDI, 1 x SDI Monitoring. SDI Rates 1.5G, 3G, 6G, 12G. Analog Audio Inputs 2 x XLR analog switchable between mic, line and AES audio. Phantom power support. Analog Audio Outputs 1 x 3.5mm headphone jack, supports iPhone microphone for talkback. Remote Control 2 x 2.5mm LANC input for Rec Start/Stop, plus Iris and Focus control using compatible lenses. Computer Interface USB Type-C 3.1 Gen 1 for external drive recording and software updates. Built in Speaker 1 x mono speaker. Talkback SDI Channels 15/16 and iPhone headset. Live Tally Indicator Tally on LCD, URSA Viewfinder and URSA Studio Viewfinder. Power Supply 1 x External 12V power supply. 12 pin Molex connector for rear battery plate. External Power Input 1 x 4 pin XLR port for external power or battery use. Power Rear camera mount compatible with industry standard V-mount or gold mount battery plates. Warranty 12 Month Limited Manufacturer's Warranty.